As we prepare to celebrate the golden anniversary of the Class of ’60, is there a “lost” alum you’d like to see at Audubon County Club in October? Judy Stine Parker says she would like to see Norma Jean Mallick Tingley again. Jim Sullins, editor of TigerGazette.com, would like to see Winston Peoples. “He ran a chewing gum and mint concession out of his locker. In The Tiger, he makes reference to getting caught. I’d like to know how he got caught,” laughed Sullins. This writer wants to see Elias Barakat again. He’s the guy who signed my yearbook as follows: “Best of Luck. Always remember the wild ones at F.C.” Everyone else who signed my annual 50 years ago wrote a message on THEIR picture. Not Elias. He signed his salutation over MY picture. Elias, you’ve bugged me for 50 years, so far. In addition to Winston, Norma Jean and Elias, I hope that others who are among the “Missing” will walk through the door at Audubon and join the rest of us for an incredible evening. It will be a walk down memory lane that we’ll never forget. Let’s hope each of us remembers it for a very long time. When my family moved from Illinois to Fern Creek in August, 1955, dad wanted to be close to his work at General Electric’s Appliance Park, so he bought a new, brick Cape Cod home on an acre lot at 8403 Beulah Church Road. Fern Creek would be an idyllic spot for the Simpson family. In the mid-50s it was a small, sleepy community. Dr. Clyde T. Moore, our family doctor, lived up the road, next to his mother, Marion Moore, who was the guidance counselor at Fern Creek High School. She was one of four original guidance counselors in the Jefferson County Public Schools and eventually had a high school named in her honor. Dr. Moore made house calls back in those days and maintained an office on Fern Creek Road, a hop, skip and a jump from the front entrance to Fern Creek High School. There were a handful of businesses along the main drag, Bardstown Road, including a couple of gas stations, a grocery store, barbershop, bank and two drugstores. The drug store next to Moore’s office had a soda fountain where you could get a chocolate malted or a Coca Cola. The other drug store was across Bardstown Road near the bank. In my senior year, when I could borrow the family car, a 1959 Buick LeSabre, I bought gas for 19-cents a gallon at Pilot, a “filling” station across Bardstown Road from St. Gabriel’s Catholic Church. My brother Roger, Class of 1962, called it “Pee-Tane,” because he figured the owner was watering it down at that price. 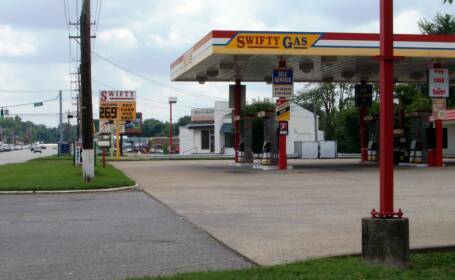 Pilot is now Swifty and gas sells for $2.67 a gallon for regular unleaded, but you can save a nickel a gallon by paying cash. Later, Jim Payne added himself, Maxine Bingham, Leo Hawes and Jim Priest. After high school, Mary Jane attended Indiana University for two years before finishing her degree in anatomy and physiology at the University of Louisville. Like many other graduates, she left Louisville. First stop was London, where she worked for four years and met her first husband, a Brit, “but he didn’t transport very well,” so her first marriage ended in divorce. Moving west to San Diego, Mary Jane married a Navy doctor and had three children, a son and two daughters. After six or seven years, that marriage also ended in divorce. “All he wanted to talk about was football,” laughed Mary Jane who finally met the love of her life in Florida; a marriage that has lasted more than 20 years. 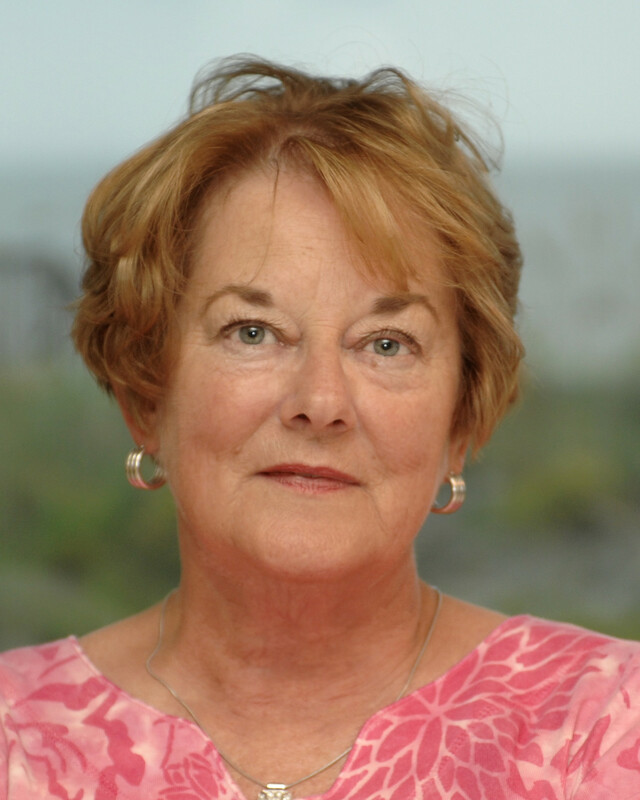 But Mary Jane confesses she really has lost contact with Louisville over the years, as many of us have; but, she looks forward to the 50 year class reunion and reconnecting with many of her former classmates. Don Espy is one of half dozen or so alumni who started first grade in Fern Creek and graduated twelve years later at Freedom Hall. Don was born in his parent’s white house in Fern Creek, on the corner of Kentucky Avenue and Bardstown Road, about two blocks from the front of the school and about a half block from the original entrance to the school parking lot off Bardstown Road. The apple didn’t fall very far from the Espy family tree. Today, he and his wife, Linda Lantz of the Class of ’60, live four houses off Bardstown Road, a half mile from his birthplace. Espy, who was inducted into the Alumni Hall of Fame last year with Louis Nagel and Jim Sullins, can recall in great detail the changes to his community over the past 50 years. “GE made Fern Creek really grow when it opened Appliance Park in 1953,” said Espy. 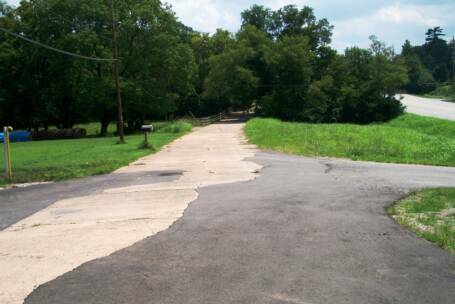 When the City of Louisville extended water lines to Fern Creek the following year, developers began to build subdivisions that forever changed Fern Creek’s character. The widening of Bardstown Road, in 1978, opened the community to further economic development, and it also helped reduce the number of head-on collisions. “When they put a big buffer between the lanes, it put a stop to all of that,” said Espy, who responded to many of them as a volunteer firefighter in high school and after graduation. “I can remember coming to school straight from a fire and smelling like burned wood,” said Espy. The idea of utilizing high school students as firefighters in Fern Creek was born out of necessity. “In 1950, only two volunteers answered a call for a raging brush fire in August,” said Espy. Later, the chief went to Willis Kay Niman, who had recently been appointed principal at FCHS and proposed starting a volunteer firefighting program which still exists today. 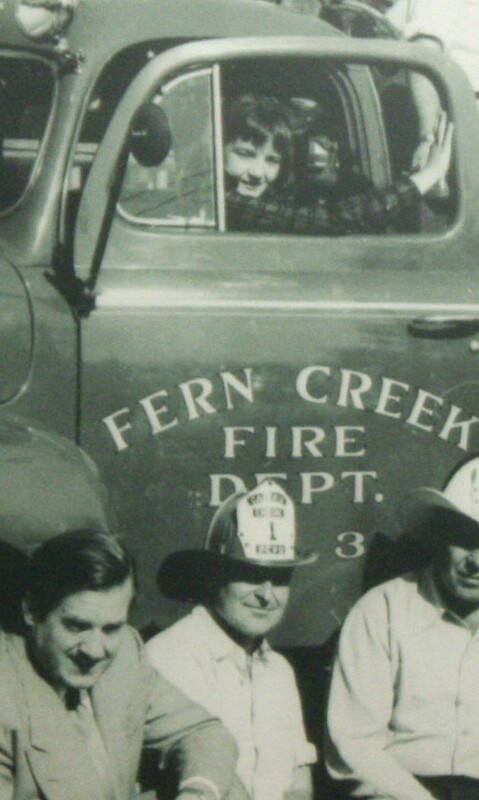 Jim Whitis and the late Jeffrey Miller from the Class of 1960 were members of the Fern Creek Volunteer Fire Department, along with Espy. Before they could don their firecoats and helmets, the school administration and their parents had to sign a waiver that they wouldn’t sue the department, if the aforementioned “infant” was hurt. The agreement also stipulated that each year no more than six students would be chosen for the program and were to be trained at the firehouse every Monday night. Some of Louisville’s “finest” firefighters and emergency medical technicians (EMT) can trace their lineage to FCVFD. William T. “Wild Bill” Klapheke didn’t take any prisoners. Maybe it was his training as a Marine that made him the most feared assistant principal at Fern Creek High. You could hear him coming long before you could see him. The sound of toe and heel taps on his wingtips was enough to put on alert anyone within hearing distance. Don Espy crossed swords with Klapheke twice and lost both times. “I got a whack the day he caught me smoking in the boy’s bathroom,” said Espy. Klapheke’s weapon of choice was a custom-made wooden paddle that had holes drilled through it. More than one male member of the Class of 1960 got WHACKED with that paddle. Espy and Shelby Baldwin were once suspended for three days when Klapheke caught them off campus during school hours. “I think Shelby and I didn’t want to eat lunch in the cafeteria on Friday, so we went over to a sandwich shop that had replaced the Eat Shop, across Fern Creek Road from the school. Klapheke was getting a haircut across Bardstown Road and saw them. “Both of us got booted out for three days,” laughed Espy. A couple of years later, Don and Jeffrey Miller responded to fire at a house on the corner of Fern Creek Road and Beulah Church Road. Arnold apparently mentioned to Klapheke how Espy and Miller had saved his house from possible destruction. For years after graduation, Klapheke and his wife would come to the blood drives at FCVFD and we would talk,” said Espy. Eighteen years after Fern Creek High School was peacefully integrated in 1956, all hell broke loose in Louisville and surrounding communities, when federally mandated busing was ordered, in an effort to achieve equality in education. The court order came a year after Louisville merged with Jefferson County, both in municipal government and public schools. Reaction to the 1974 ruling caused emotions to boil over. Trouble spread quickly from Dixie Highway to Preston Street in Louisville, where protestors took control of the Second District police station for about three hours. “People were intimidated to the point crosses were burned in the yards of bus drivers and teachers were being threatened if they showed up at school,” said Espy who remembers “good ole boys” from Fern Creek stealing tires from a service station and setting them ablaze in the middle of Bardstown Road. At one time, there were about 5,000 angry people marching down Bardstown Road, venting their disdain for forced busing. “Some hurled Molotov cocktails at Dr. Dooley’s office, next to where the old Fernmoor Pharmacy was located. Flames were so hot they cracked windows in the pharmacy,” according to Espy. 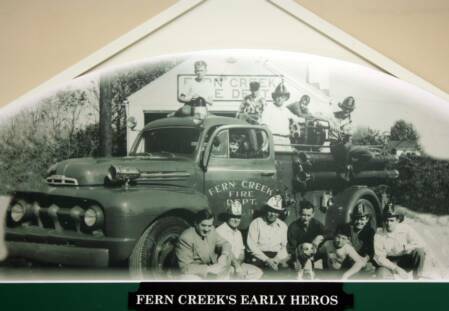 At the height of the civil unrest, Fern Creek’s Volunteer Fire Department was commandeered by Jefferson County police, for use as a staging area for combating the rioting that was taking place in the metro area. “They strung three strands of barbed wire on top of an eight foot chain link fence that surrounded the parking lot where they parked their cruisers and buses,” said Espy who remembers that hot summer night when an angry mob tried to storm the makeshift compound. Somewhere between his junior and senior year of high school, Don Espy had decided he wanted to be a barber. He also wanted to become a professional firefighter, but there was a problem. “In those days, fire department recruits had to have good vision without glasses, because the masks that firefighters wore wouldn’t fit over glasses,” said Espy. “Kind of silly when you think about it, because you can’t see anything in heavy smoke. It’s all by feel,” said Espy who managed to satisfy his need to eat smoke by remaining a volunteer firefighter. Later, the air breathing apparatus firefighters wore on their backs came equipped with tactical safety glasses for four-eyed firefighters like Espy. Over the next 22 years, Espy rose through the ranks and eventually became chief, a position he held for 15 years, until he retired in 1993. After retirement, he missed the adrenalin rush; so, he returned to the fire line. Espy estimates he answered 8,000 calls over 38 years, until his body told him to hang up his helmet and concentrate on cutting hair. If you need your ears lowered, his shop is located at 3333 Bardstown Road, across the highway from the old Brown Suburban Hotel, near the Watterson Expressway. Linda Lantz, moved to Fern Creek from Erie, Pennsylvania when she was 12 years old. She and Don met at Fern Creek Methodist Church, where they were members of a youth group. They married in 1962 and moved into their first apartment, in a house across Beulah Church Road from the Homer Simpson residence. Wilma Jane Ferris was also from Erie, but didn’t know Linda Lantz until arriving in Fern Creek. Wilma’s future husband, Dale Radford moved to Fern Creek from Trigg County, Kentucky. They also stayed in Fern Creek. Like the Espys, the Radfords have watched their community change dramatically in the past five decades. “I think Bardstown Road is the biggest change,” said Wilma, “We can only turn right when we leave Fern Creek Methodist Church after services on Sunday, because it’s against the law to turn left out of the church parking lot and go the other way on Bardstown Road. “Just as well, traffic is heavy anyhow, and if you think Sundays are bad, you should try driving through Fern Creek between 4:30 and 6:30 p.m. It’s worse than Dixie Highway, during rush hour,” said Wilma, as Dale joined her to talk about the changes they’ve seen over half a century. College in Louisville and worked at Citizen’s Fidelity Bank in Beuchel, until the first of three children came along and she became a homemaker. When the children went to school, she went to work in the cafeteria at Dunne Elementary and managed the food line there for 21 years. Dale got a job at the Coca-Cola Bottling Plant in Louisville after graduation. The plant owner, Mrs. Martin L. Schmidt, hired Dale. Mrs. Schmidt lived on the Lad & Lassie Farm on Bardstown Road, just south of Beulah Presbyterian Church, where she kept this writer in part time work all through high school. “I wouldn’t have had a job had it not been for her,” said Dale who spent four years at Coca-Cola before moving to the assembly line at the Ford plant, where he retired in 2004. 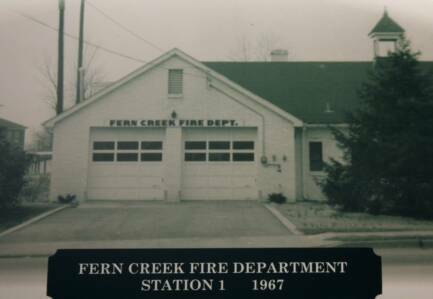 Looking back on the past 50 years, Dale Radford says expansion of the fire department was one of the biggest changes in Fern Creek. “The town’s small fire station is now one of the largest fire and rescue stations in Louisville,” said Dale. It’s also the centerpiece of the community. Over the years, attempts have been made to incorporate Fern Creek, but each time they’ve been defeated. Don Espy served twice on committees that dealt with incorporation. Although Fern Creek was never incorporated, it was eventually swallowed up by suburban sprawl. You can still get lost there if you’re not careful. Just ask 1960 alum Judy Stine Parker. Judy was raised at Hikes Point and fondly remembers being able to eat lunch for 35-cents at Louisville’s first McDonald’s, 20-cents for a hamburger and 15-cents for a soda. Stine, who, along with Mark Morgan, was voted “Most Collegiate” in the Class of 1960, attended Norton School of Nursing after graduation. Little did she know much she’d need those skills. She was caregiver to her parents and also to her late husband, Skip, who died in January of this year. Now, she manages several properties she owns, including a 108-unit apartment building in Louisville. I caught up with her on her mobile phone, as she was traveling to South Carolina. Judy, her two sons and their families are keeping a family tradition alive. Each year they vacation at Sumter, south of Myrtle Beach. Although she got lost in Fern Creek, Judy believes the Gene Snyder Freeway really opened up the Louisville metro area. 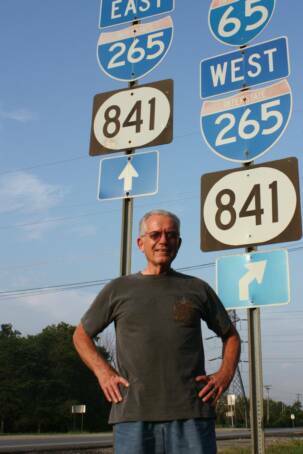 “The interchange at Bardstown Road is the largest one along the Gene Snyder,” said Floore. He ought to know. After graduation from the University of Kentucky in 1964, with a degree in civil engineering, Denny, who was born in Louisville and lived in Jeffersontown with six brothers and sisters, went to work for the state highway department as a planning engineer. Until he retired in 2001, Denny was responsible for maintaining the overhead lighting and signage along the network of streets, roads and highways under state control. “Back in 1967, we began planning for future growth in the Louisville area,” said Floore, even before there was such a catch-phrase as “urban sprawl.” He says some of the major routes that were part of the Master Plan Floore helped develop in 1969 will probably never be built. He joined the Marine Corps and Jill went to Murray State College two years later, where she majored in business; but, the leatherneck was smitten by the homecoming queen. They got back together and married during her sophomore year at Murray. 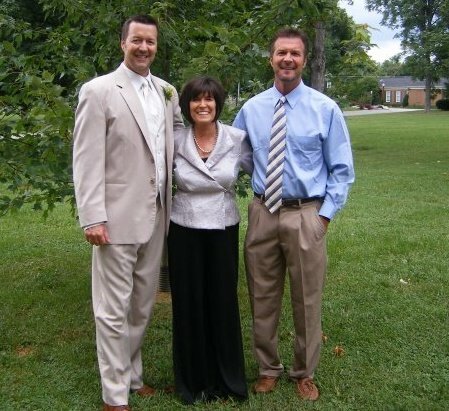 Jill didn’t finish college, but Ken got his degree in computer science, while holding down a full time position at the Ford plant in Louisville, and helping Jill raise their two sons, both of whom live in Bardstown. After living and working in western Kentucky and southern Indiana, the Dennisons returned to Bardstown where they bought a Papa John’s Pizza franchise, one of the first 50 franchises sold in 1991. “We became sold on Papa John’s,” said Jill, “when John Schnatter, the owner of the company, delivered free pizzas to my son’s school in Indiana.” Schnatter built a pizza empire. There are now more than 3,000 Papa John’s across America. One franchise soon grew into a second franchise in Lebanon, Kentucky. When Ken became ill, Jill sold both, so she could care for him. As Jill rushed home for our interview, she drove through Fern Creek. “It doesn’t look the same,” she said. “The small town atmosphere that I knew in high school is gone. So is the Eat Shop where we hung out before and after classes. • Judging by the amount of open space around Fern Creek when my family moved there, the population was probably half of what it is today. The all-brick Cape Cod house on one acre cost my parents $13,000, in 1955. I can remember mother fretting over how she was going to make the monthly mortgage of $87. The house sold for $65K after Dad’s death in 1995 and today is worth $165,000. Times do change, don’t they? Take a virtual walk down Fern Creek's Memory Lane, as the author revisits the country town he remembers and learns some of what happened in the fifty years since he left. 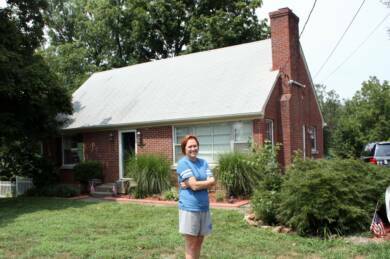 Many chilren of the fifties grew up in little brick houses, like this one in Fern Creek, where Ross Simpson lived with his parents and three siblings. Current owner Daun Gollar is shown during the surprise visit Ross made to the home. Daun has moderized the interior, but the fireplace Ross remembers is still working. The old Pilot station is where Freddie Gorin stopped every afternoon to buy a quart of reclaimed motor oil for his his old "slush-a-matic" Chrysler, which had an automatic transmission with a manual clutch. Freddie's car used more oil than gasoline. While traveling around Fern Creek, taking photos for this story, Don Pierce found a short stretch of the concrete Bardstown Road we remember. Don wants to break it up into small pieces for souvenirs. 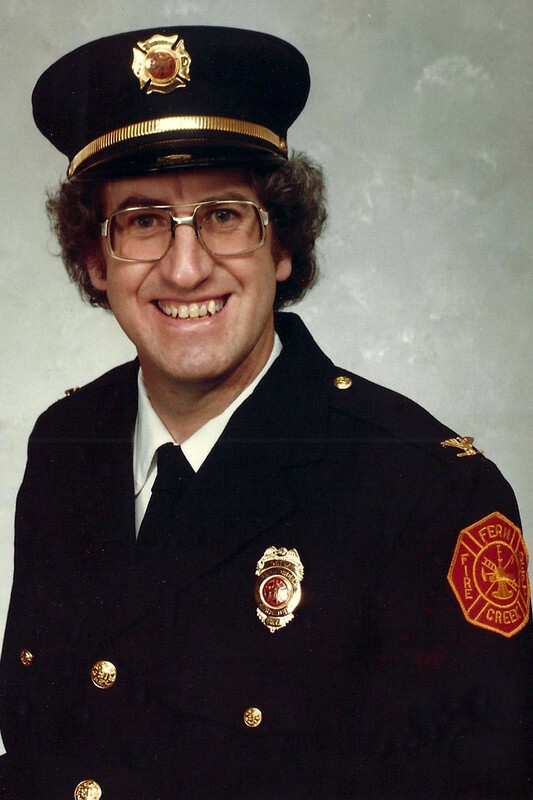 Don Espy began his firefighting career while a student at Fern Creek. He continued for 38 years, 15 of which he served as Chief. He was inducted into the FCTHS Alumni Hall of Fame last year. Linda Lantz and Don Espy met in a church youth group, while both were attending Fern Creek. 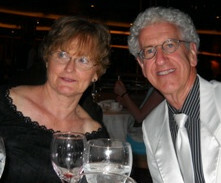 They've been married 48 years, during which time Don has taken to color coordinating his hair with his clothes. Dale Radford and Wilma Jane Ferris are another Class of '60 couple who decided to make a lifetime commitment. 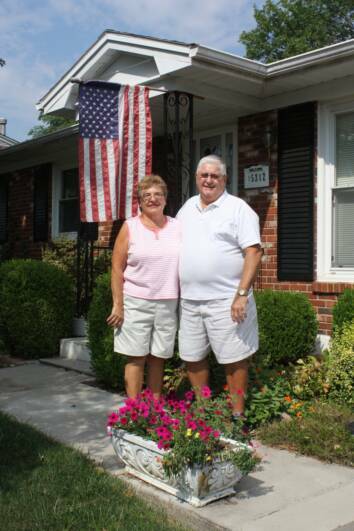 They've always lived in Fern Creek and have watched the little town grow into a busy suburban community. If you drive in Kentucky, Denny Floor has touched your life time after time. He was the lighting and sign man for the highway department. Judy Stine Parker has never lived in Fern Creek, being a Hikes Point kid, but she knows what it's like to get lost there. She was surprised by the growth. Jill Wring Dennison and Judy Stine Parker have a lot in common. They both lost their husbands to Alzheimer’s disease and dementia respectively. Jill’s husband, Ken, died a month after Judy’s husband passed away; but, neither knew about the other’s loss until this article was written. After interviewing Judy, I called Jill. She was busy in the kitchen, preparing a meal for friends, and couldn’t talk, but we set a time for a return call. Calling then, I was about to hang up on my third no answer attempt when a voice answered. Jill, out of breath, had hurried into her house in Bardstown and grabbed the telephone. “I’m sorry I’m late for our interview,” Jill said, but she had a good excuse. “My oldest son’s wife just had my fourth grandchild today at Baptist East,” said Jill. Bentley Paige Dennison joins two other granddaughters and a grandson. She was born on what would have been her grandfather’s 70th birthday. Jill and Ken weren’t able to celebrate their golden wedding anniversary, but she remembers the good times they had together. a photo posted on Facebook. 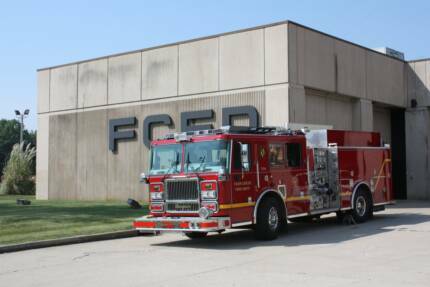 "I just saw the new piece by Ross about old Fern Creek and the fire department. If you'll look closely at the picture of the first fire truck, I am sitting in the driver's seat. My father is the first man on the left, kneeling in front. Until the firehouse was built, the truck was kept at our house. My mother LOVED that! Daddy was one of the founders. I also remember we had a plate on the front of our car saying "FCFD" which must have impressed a few traffic cops in Washington DC; because, when we took a vacation there, they always stopped traffic to let us through. What a hoot!"